About Rat and Rodents: These animals love to live inside homes, often in the walls or attic. They are rodents, and they often chew on electrical wires. They also often break into the kitchen, and they spread filth, disease, and most of all, pestilence. We are experts at rat and rodent control and removal from private homes and properties. We excel at both Arlington rat and rodent trapping and prevention. We are not a rat and rodent exterminator company, but we use techniques such as humane live trapping, prevention, and exclusion to solve your Arlington / Fort Worth rat and rodent problem permanently. We boast a 98% success rate, the highest in the industry, and are voted the Arlington / Fort Worth area's top wildlife animal control company. Give us a call at 817-717-3606 and we will take care of your rat and rodent issue for good. About Us: All Animal Control in Arlington and Fort Worth TX is a full-service, licensed and insured nuisance wildlife control company. We solve conflicts between people and Texas' wildlife. We are considered the best wildlife control company in the Dallas area, and our rates are not only competitive, but well below the average for the area. We are a small, owner-operated company, and we don't have the overhead of the big companies. Also, unlike the larger companies, we do our own work (not some underpaid and careless employee) and we take great pride in our work. Give us a call to discuss your Arlington rat and rodent removal project, and we will give you a price quote on the phone, and schedule a same-day or next day appointment at your convenience. Gentlemen: I have a noise in my walls for the last six weeks.....I had all openings closed....I am told nothing can get in or out..... There are no droppings in my attic...traps and cage have been set.....nothing ever caught..... Noise still continues most nights starting after 12:00am....noise comes and goes for a few hours.....sometimes you will hear a noise and then not again for quite a while....each time the noise is heard it is for a short period of time....yesterday morning was the first time I ever heard it during the day and had not heard it the night before.....it has gone, on occasion, a few days without noise and then it starts again. How is that? I heard a big noise one night a few weeks ago that sounded like something fell down the wall to the baseboard. Every time I hear the noise it sounds like it is at the base board...which sounds like it is in the house....my house has been checked no signs of anything in the house. My question is.....is it possible for something such as a rat, or whatever to live for weeks without eating or drinking....there is food and water in the cage....food in the traps.....neither has been touched. No one seems to know what to do.....cannot pinpoint exactly where it is in the walls. I am told that an animal could not live so long without eating or drinking. If stuck at the bottom of a wall, as indicated on your website, how long can they go without eating or drinking? Thank you for help.....the entire situation has taken over my life. Thanks. An animal can only go a few days without water. Humans can go only 3 days. It may not be an animal creating the noise. I've seen many cases in which there's a piece of cardboard fluttering in the ductwork, or a bush or tree outside scraping against an outer wall or roof... Perhaps you need to investigate other possibilities. Rats create a lot of problems for the people in whose house they end up residing. Since brown rats are found all over Texas so mostly people are familiar with this type of rat. These rats have replaced the black rats and since they are evolving they have become more immune to extreme weather than the black rats. They end up chewing everything that comes in contact with them whether it is leftovers of the food in the garbage cans or wires or plastics sheets or even paper in the house. Since they reside in dark and damp places where humans visit occasionally or not at all the attic for residing is best option for the rats. But rats are not only found there so one has to find out where the rat is in one’s home and remember to keep pets away from it by moving them outside or to another room in your house. This is because the rat can transmit any disease that it may be carrying, to the pet. This can be through a bite or even a scratch. Open a window wide in the room in which the rat is trapped so that it can have an escape. Apart from one opening, close all the other doors and windows without getting too close to the trapped rat. Leave the room in which the rat is trapped, closing the door behind you. Since you are leaving the rat with only one escape choice, chances are that it might leave. Leave the house for a few hours taking your pet along with you. This will give the confused rat time to figure out the one way escape you have left for it. There should be no available food in the room in which the rat is left; otherwise it would have a reason to stay. When you return, do thoroughly check the room. To remove a rat from the attic, the following methods can be applied. Seal off the attic. Inspect the house and seal the attic well. Look any spaces big enough from where a rat can get in. This is the real key to Fort Worth rat extermination. You don't kill the rodents, you keep them from getting inside the building. Close your chimney with a wire mesh. Close all the chewed out holes except for one. Leave this as a one way escape for the rat. Close this a few weeks after the problem has been solved. Also close any entrance from the attic to your house. Create an exit. As mentioned earlier, create a single exit for the rat. The exit should be large enough for the rat. The dimensions of the exit should be such that it is easy for the rat to leave and hard to enter back Draw them out. Place some sort of food such as apple slices or nuts to make the rat leaves. Set the right sort of trap. Use a humane live cage trap for this purpose. 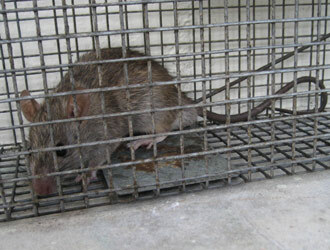 It is recommended that the trap is placed out of the way It is better to use a small trap rather than a large one because the rat might panic and hurt itself in the large trap. Read the instructions for the trap before using it. Use the right sort of bait. Rats will not walk into the trap unless a bait is placed. Apple slices, nuts and crackers can be used. Remember to place the bait in the centre of the cage so the rat has to walk in. Relocate the rats. After catching the rat, relocate it as far as 10 miles from your place. But to be honest, lethal traps are a far more practical method of Fort Worth rat control. Professional help can also be acquired for this matter. Check the attic for baby rat. It can be that you have caught a mother rat and the young are left behind. They will not survive without their mother. Wear heavy gloves while approaching a rat, because it can carry harmful diseases which can be transmitted from a scratch or a bite. Do consult your local wildlife laws for trapping and relocating animals. Keep the traps in place until all rats are out. Replace your trap after catching a rat for at least another week. Scare them off with sound. Ultra sonic sound repellers can be used for this purpose. Since they produce a high decibel noise that is unbearable for rats. Flash lights. Flash lights or strobe lights can be used to scare away rats in your attic. Use commercial rat repellent. Market available repellents can be used, along with predator urine (fox spray). Only some have been fortunate enough to have success with this method. Use ammonia-soaked rag. Old used rags soaked in ammonia can be placed in the attic as well to repel rats Pet and children must be kept away from the attic when this method is used. Scatter mothballs. Mothballs can be placed at the entrance of the attic but there is no sure shot success of this method. But these products are not effective Arlington rat removal methods.